If you remember from my SnapChat, I was thoroughly disappointed when the first chandelier I’d ordered was way too long. When we first started planning out my master bedroom, we’d originally thought we were going to do vaulted ceilings, so we had a longer fixture on the design board. Unfortunately, Maddie and I both forgot to switch it out with a shorter fixture for my 9 foot ceilings! After spending several days searching online and around the Design District in Dallas, I felt a little defeated that I couldn’t find a proper chandelier that wouldn’t hang too low or overwhelm the space. That’s when I decided to ask my lovely SnapChat followers for help! Thanks to one of you (didn’t screenshot it, so I don’t remember!! Sorry girl! ), I was introduced to Ro Sham Beaux, a Charleston-based company designing the most incredible chandeliers and light fixtures! Described as a fusion of Charleston and Venice Beach, California, the collection merges high design with natural elements like hemp and hand strung beads (think textured quartz, luxe crystals and even recycled glass). Right up my alley! When I first visited the site, I of course was looking at the pre-set fixtures available, but none of them met my height requirements. That’s when I noticed the “design” button in the menu… Hallelujah! 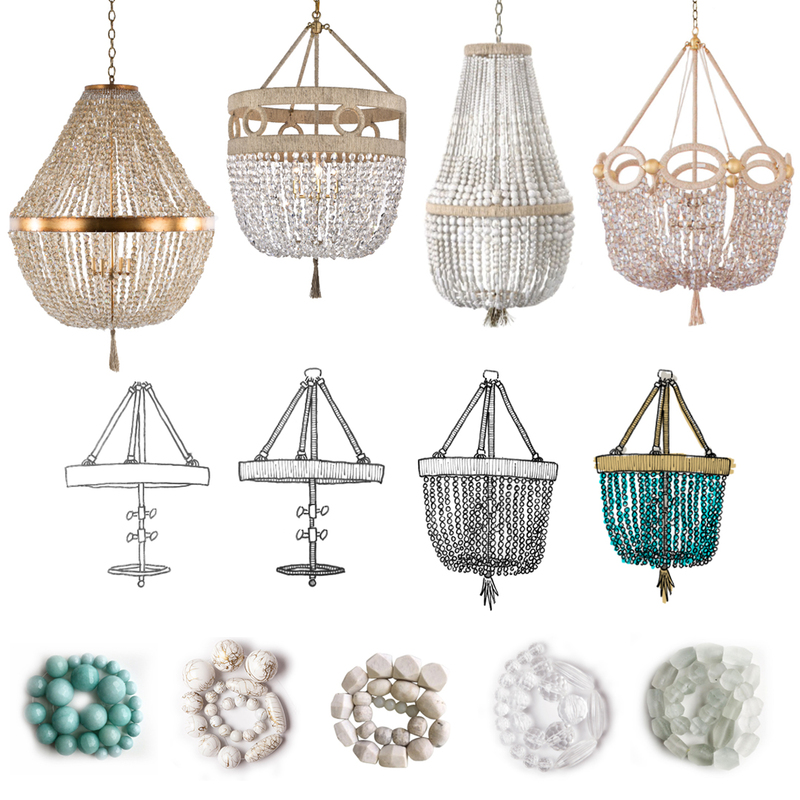 If you’d like to design your own unique fixture you have two options: select your shape, size, hemp style and beads through their online step-by-step guide, OR you can contact them for a custom quote. Because I wasn’t seeing the size/height I needed for my space in the create-your-own section, I reached out to see what my options were. I heard back less than 24 hours later with the best news ever! Just last week I had a call with Calli to chat details and figure out the best style and colors for my space. Ro Sham Beaux has a wonderful gallery on their website featuring their fixtures in stylish spaces around the country, so luckily I had a general idea in mind of the look I wanted. Because of my height restrictions, we decided to go with the Malibu style in a semi flush mount frame (which means we still get the arms, but no hanging chain). This particular style definitely has a casual luxurious vibe to it, and I think it will complement the other more modern pieces in my room! The only thing left to decide on is the hemp color and the type of bead I want strung on it. Because I have quite a bit of gold happening in this room, I’m leaning towards the gold hemp so that it all ties together. With that said, the white hemp is their newest offering and is very popular, so I had Calli send me a sample of each (see below!) to be sure! Also, while I love the look of crystal beads, I think they may be too glam for my master bedroom. The other option I’m looking at is the white swirl, featuring swirls of gold on the beads (second from left in the photo above). The inspiration gallery gave me lots of ideas, especially for incorporating a rich pop of color… but with my headboard being a pretty bright blue, I don’t want to have a competing color in the chandelier. With all of that said, I NEED YOUR HELP! Comment on my latest instagram photo with your favorite beads to help me choose! As you can imagine, I am thrilled to have found a solution and absolutely cannot wait to see the fixture installed! 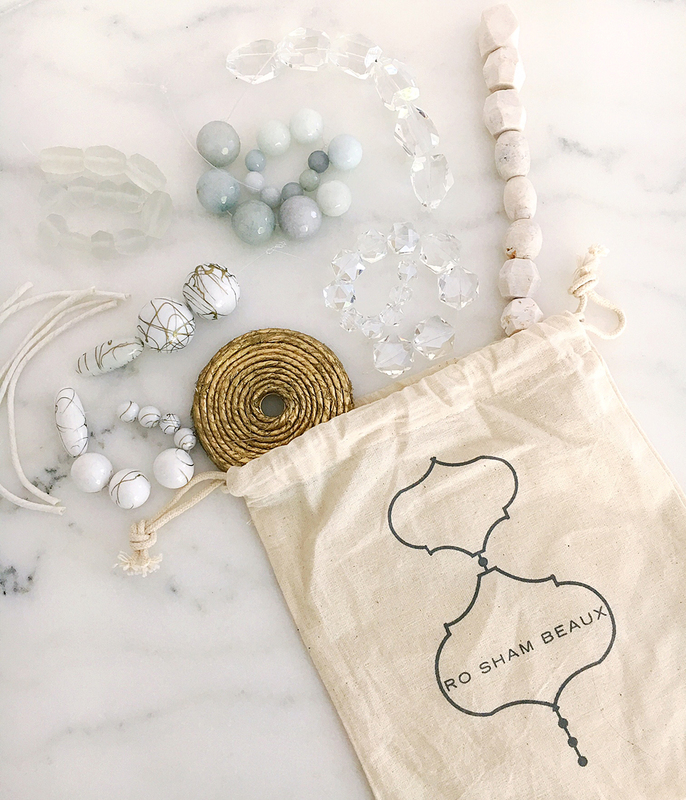 Ro Sham Beaux already been so impressive every step of the way, and once I select the hemp + bead combo, the lead time is only 1-2 weeks! All of the beaded fixtures are made to order (even the pre-set styles), which makes them all the more special. Click here to discover all of their incredible light fixtures or design your own. Thank you to Ro Sham Beaux for working with me to create the perfect chandelier for my new home!! Oo can’t wait to see and hear more updates on the style of Chandelier! Congrats on the new house! It’s been fun to watch your snaps about the progress and I look forward to seeing it all completed.